Bullseye Outfitters in Trout Creek, Montana. Elk, Whitetail Deer, Mule Deer, Bear, and Turkey Hunting. 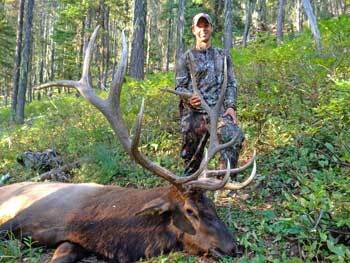 Please contact us with any questions about our Montana guided hunts. Welcome to Bullseye Outfitting and Montana's finest big game hunting. 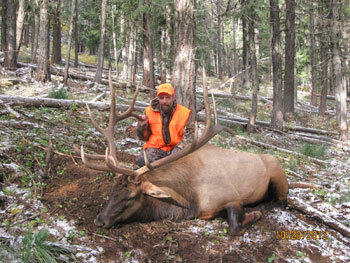 We offer guided hunts for elk, mule deer, white tail deer, bear and mountain lion. I have been guiding and outfitting here in the lower Clark Fork Valley for over 30 years. The mountains that surround the valley are a hunters paradise. Bullseye Outfitting is licensed to hunt on the Kootenai and Lolo national forest. This is a very large amount of country to hunt that produces trophy animals year after year. Whether I'm guiding hunters for elk and deer, chasing mountain lions with my hound, or looking for elk antlers in the Spring, I am out enjoying the mountains that I live in. These are fair chase hunts. Most of the hunts are run out of our lodge. We also have two spike camps that we hunt out of. Most of the hunting is done on foot, however we do use horses as well. We will do every thing we can to make your hunt is an enjoyable and successful experience while hunting with us. Take a look at the comfort of our new sleeper cabin. A large percentage of our clients that hunt with us every year have hunted with us before. Together with you, myself and our guides we will work hard to ensure that your hunt here at Bullseye Outfitting will be as good as it can get. For more information on our Montana guided hunts, please call Ben Mummert at 406-827-4149.